Recycle Rare Earths at Home, with a Screwdriver. Let’s call this a lesson in avoiding absolutes. Below, two versions of a component in every hard disk drive. The circled components – the valuable, important components – are magnets of the (capital R, capital E) Rare Earth variety. That is to say, they are magnets manufactured, in part, by adding a dash of the mysterious elements that my colleagues in the media have rendered quasi-mystical, and the Chinese have rendered more valuable via (reportedly, export bans). I show them, in part, to clear up the mystery. 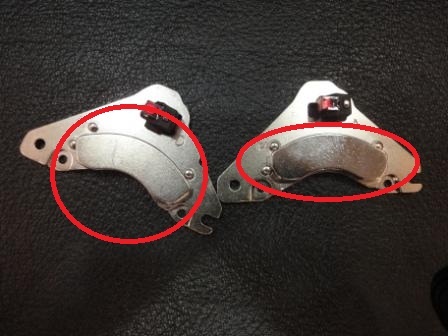 So here, dear readers, circled in red, are examples of the rare earth actuator magnets present in pretty much every hard drive on the planet (stay in your seats, please). I bring them up, also, because, based upon some of the things that have been written about rare earths over the last few months, one might have the impression that the recycling and recovery of rare earths – in part to deal with Chinese export restrictions – is something that requires high-tech. But, of course, based upon the above photo, you can pretty much judge for yourself: the only technology necessary to recover the rare earth magnets in a hard drive (how many hundreds of millions?) is a screw-driver. And that’s precisely how it’s done in one part of Malaysia, where this photo was taken: workers disassemble hard drives, pull out the magnets, and return them to the manufacturers. And the workers do this for roughly US$300/month – a more than sufficient living wage in that region (but not, I’ll admit, for someone who eats organic in San Francisco). 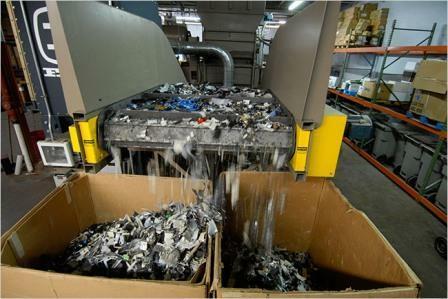 Yes, the process is as dumb and wasteful as it looks: hard-drives are shredded – rare earth magnets and all – and then run through various mechanical separators that are indisputably less effective than humans in recovering the various materials that constitute electronics. But one thing is certain: the separators attached to American electronics shredders aren’t capable of recovering rare earths. Those materials are lost, melted away, or landfilled. In other words: this process encourages more environmentally-destructive, and unsafe, rare earth mining. The frustrating irony, though, is that there’s nothing magical about recovering rare earths from a hard drive. You need only export those hard drives to a place where mechanical dis-assembly is cheap enough to be profitable – that is, worth it for somebody to buy some screw-drivers and set up a business. I bring this rather complicated, and somewhat blog-unworthy argument to my readers for two reasons: a) it’s on my mind this last week, and b) it goes very much against the mainstream liberal groupthink about electronics recycling in the United States: namely, it’s bad and environmentally unfriendly to export your electronics to low-wage countries. You’ll get no argument from me that electronic waste exports can, in fact, be very bad for human health and the environment; but the absolutist case against such exports – propounded by advocacy groups and most of the global media – obscures the collateral environmental and human damage done by “recycling” those materials in the developed world (every rare earth magnet not recovered at a US electronics shredder is a rare earth magnet that must be mined in China). If you can extract more recyclable material from a hard drive in Malaysia, and do it safely, why on Earth would you argue that it should remain in the United States? But that’s precisely the argument that’s been made, with little counter-point, in the American media for more than a decade. It’s time to start thinking a bit more expansively, with a screw-driver in hand. This entry was posted in Computing, Environment, Scrap by Adam. Bookmark the permalink. Extracting the magnets themselves from the hard drive is low-tech and simple. Once the magnets are out, though, it gets a little tricky (here is the part where you get to surprise me and tell me that the magnet supplier receiving the reclaimed magnets are able to reglue them into assemblies as received. My experience has been otherwise, especially since each recycled drive likely has a different chemisty and geometry from the next one). The adhesive needs to be stripped, as well as the (nickel?) plating. If the magnet supplier knows the precise grade of NdFeB magnet, these can be demagnetized, crushed, processed, and introduced to the ready-to-press powder. If the precise grade is unknown, then the stripped magnet has to be melted and its chemistry tested before it can be reintroduced into the manufacturing process. Of course the disk drive magnet business has such ridiculously low margins that the reclaimed material might not even be making it back into disk drives and be reintroduced into different material grades for entirely different applications (which is also pretty cool). And here’s where I surprise you: the magnets are re-glued into assemblies. It’s a bit more complicated than that, and due to some confidentiality I can’t explain why, but that’s the basic deal. But yes, you are quite right that this isn’t going to be 100% straightforward – a 10mb drive circa 1995 just isn’t going to have parts, rare earth or not, that are directly re-usable in 2011. But it will have materials, including rare earths, that can be segregated out by hand, only, and re-processed and re-used. My wider point, though, is that without manual labor, we can’t even have this discussion. In that case, everything gets shredded and lost. Moving on from rare earths to the whole liberal guilt thing about factories in third-world countries — Nicholas Kristof once suggested that we should all support sweatshops. Because if you actually look at what happens when there *aren’t* factories to employ unskilled workers, you conclude that sweatshops are actually a massive net positive to those being exploited. I’m no expert on Rare Earth Metals. However, from a general political, environmental, ecological and economic viewpoint, it seems that common sense beckons for an overall change in the way that technology and precious finite resources are mined are consumed. The first operative word is obviously the word ‘finite’ which is unarguable, ie. the supply and demand equation of population expansion / cost (financial and ecological)of extraction and availability of raw materials. Secondly is what I recently hear dubbed as, ‘eco-eco destruction’. I’m sure there are voices who’ll contest the relationship between an increasingly serious ecological breakdown and the widening of a global wealth and income gap, yet I say, just turn on the news, open your front door, look at a thermometer. Proof is all around. Recycling, (on a global scale), might at least buy humanity a few more decades. What is there to lose? Or are we just going to keep using all resources until and then start? Sorry if I veered away from the issue. Right. Why is the contrary argument so pervasive? My question is, if the casing (aluminum avg $1.28 lb) and the copper stuff inside (about $4.49 lb) and the rare earth metal magnet (really, who knows, but some speculate $3,400 kg) and the platters (made of mostly aluminum with a bunch of heavy metal, gold, platinum, etc), who actually can recycle the materials here in US? Who can process the heavy metals here, the platters, the various pieces and parts, to make it worthwhile to disassemble them? Where is the local market? A pound of something is still a pound of something whether it comes out of 10,000 hard drives or not (liberally speaking, of course). If that pound of something is platinum, gold, palladium, etc, it should be just a matter of finding someone who pays enough to make it worthwhile. Having 10 hard drives doesn’t really do anything for anyone, but having 10,000 or so at a time should maybe make a bit of a difference to a company that can pay to reclaim these metals. unfortunately gwg does not have the knowledge nor the infrastructure of how to recycle ndfeb magnets, GWG i only an alloy producer. only rare earth magnet manufacturers could do the recycling economically viable.